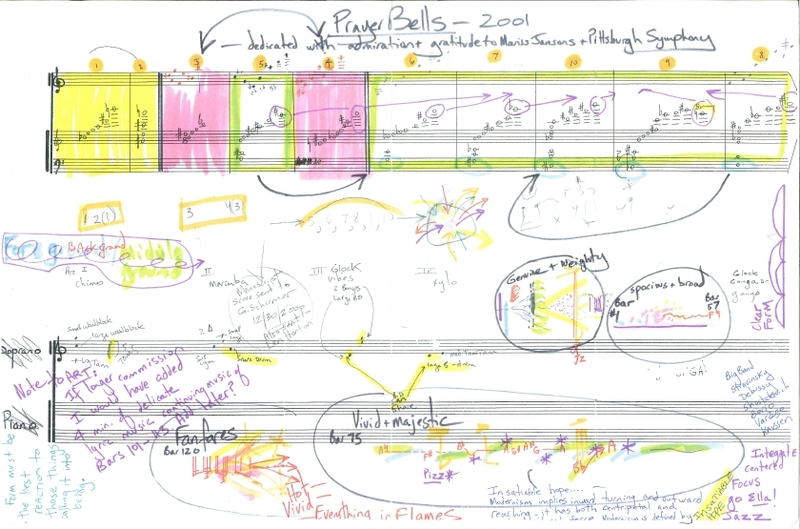 Prayer Bells is scored for piccolo, three flutes, three oboes, three clarinets, bass clarinet, two bassoons, contrabassoon, four horns, two piccolo trumpets in B-flat, two trumpets in C, two trombones, bass trombone, tuba, tubular chimes, large tam-tam, two woodblocks (large and small), five tom-toms, concert marimba, two triangles (large and small), suspended cymbal, vibraphone (motor off), glockenspiel (sounding two octaves higher than written), two bongo drums, large bass drum, xylophone, (sounding one octave higher than written), medium tam-tam, large bass drum, harp, and strings. Approximate performance time is twelve minutes. My favorite moment in any piece of music is the moment of maximum risk and striving. Whether the venture is tiny or large, loud or soft, fragile or strong, passionate, erratic, ordinary or eccentric...! Maybe another way to say this is the moment of exquisite humanity and raw soul. All art that I cherish has an element of love and recklessness and desperation. I like music that is alive and jumps off the page and out of the instrument as if something big is at stake. I do believe that all music of substance should have an immediacy about it, while, at the same time, though, I also know that we, as human beings, are attracted to enigmatic things such as nature, gravity, the cosmos, space travel, God and religions, advanced math, myths, love etc. I believe we find such enigmas in art and I try to reach toward these mysteries in my music. Prayer Bells is, I hope, at once vital, present and immediate on first hearing, while at the same time distinctive and spiritual so that it can withstand multiple hearings. My work Prayer Bells for orchestra craves a listener...and I am honored to have made it for the audience in Pittsburgh. There is an indisputable journey taking place during the 12-minute composition. In general the score falls in to a three-part form: a slow growing introduction of 90 seconds (which is a section of music I composed in 1988 as a student as wanted to rework in a more refined manner); a central section of about 5 minutes which is led by the line of music in the cellos, violas and other strings which is often punctuated by brassy flares; and the final section of about 5 minutes which is best described as relentless, sinuous, fanfares which are alternating with other earnest, more expansive materials. The music is passionate throughout as if something big is at stake in it. The "bells" are not only simply percussion instruments in this work. Rather, the bells are often implied by blended woodwind, brass and string sounds. The title Prayer Bells can mean anything from miniature, intimate prayer bells one would find in a meditation context, to a massive carillon of bells in a cathedral, to metaphorically representing an inner tolling to pray in the human soul. "The words "contemporary music" once evoked fear, loathing and occasional panic among many classical music fans, whose concept of what was acceptably "new" seemed to stop at the year 1900. Last night's Columbus Symphony Orchestra concert, performed in conjunction with this year's Ohio State University Contemporary Music Festival, demonstrated just how much times have changed. The concert, guest conducted by Portuguese maestro Joana Carneiro, not only drew a large crowd to the orchestra's home, the Ohio Theatre. It had the audience on its feet cheering at several points. Of course, a lot of contemporary music has changed as well. What was once often laboriously, self-consciously experimental has become comfortable with itself — approachable, comprehensible — even pleasant. The contemporary music featured this weekend is an example. 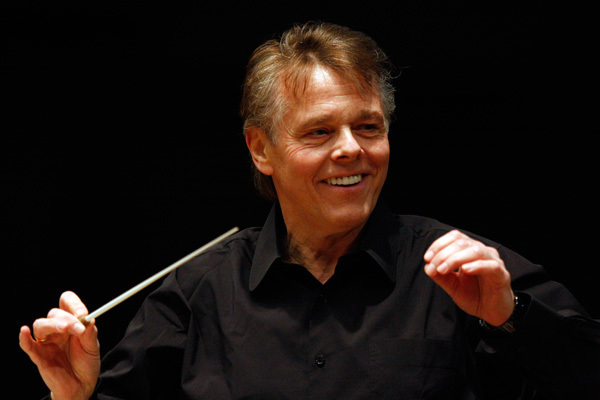 The works of Augusta Read Thomas, composer-in-residence at OSU's School of music in conjunction with the festival, are innovative and engaging. Thomas' Alleluia opened, featuring the Symphony Chorus singing in beautiful a cappella, featured a slow pedal point and built to a dramatic finish. A second work by Thomas, Prayer Bells, was performed on the second half. Here much of the innovation came in the orchestration, which created the sense of bells tolling from all around the stage." To purchase a sketch of Prayer Bells, please visit the Online Store. Augusta Read Thomas's works, please contact G. Schirmer Inc..